It seemed like an impossible task, but back in 2009, wunderkind J.J. Abrams pulled a small miracle and revitalised the beloved Star Trek franchise with a film full of energy, pop and vitality. What once felt old and tired was suddenly new again. His follow-up, 'Star Trek: Into Darkness', seemed likely to top that, with a plot shrouded in secrecy, a mysterious new villain and the confidence that this new approach seemed to work. In truth, 'Into Darkness' proved to be just as thrilling as the first, and yet, at the same time, its greatest asset also proved to be its greatest weakness. 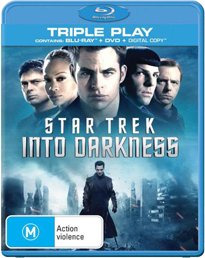 Reprimanded after breaking basic Federation protocol, Captain James Kirk (Chris Pine) is called back to lead the USS Enterprise after a mysterious terrorist, John Harrison (Benedict Cumberbatch) attacks Federation headquarters. With his team in place, including an increasingly distant Spock (Zachary Quinto), Kirk follows their target into the volatile Klingon system, armed with a full arsenal of experimental weapons. But very quickly, Kirk and the crew of the Enterprise begin to realise that their mission, and Harrison himself, are not entirely what they appear to be. It goes without saying that 'Into Darkness' demonstrates everything wonderful about the Hollywood blockbuster: it's slick, shiny, snappy and often exhilarating. Background exposition was covered back in 2009, so there's no wasting time before getting into the crux of the story. What Abrams and his team at Bad Robot have crafted is a story almost more intriguing than the first film, built around the central presence of Cumberbatch's legendary villain. Who he turns out to be is probably common knowledge by now, but for those that haven't been spoiled, his reveal is a delicious and cheeky surprise. There's a tad less action in his instalment, but that is replaced by genuine tension in the unfolding of secrets and mysteries. An unfortunate casualty of the narrative is that the rest of the crew, arguably the highlight of the previous film, are lost in the background, especially Karl Urban's wonderfully prickly Bones and Zoe Saldana's spunky Uhura. Visually, the film carries all of Abrams' trademarks, including dizzying camera acrobatics, lens flare galore and a terrifically dynamic score from Michael Giacchino. What is most surprising about 'Into Darkness', though, is that, apart from the reveal of Harrison's true identity, there are no real surprises in 'Into Darkness'. This film carries so many features of the previous film that, even though it does them just as well, it fees like something we've seen before. Also, unlike many franchises, this film doesn't attempt to link directly with the events of the previous film apart from nods and acknowledgements, so the film feels very self contained and episodic. This isn't necessarily a fault of the film, but as a consequence, the same edge-of-your-seat exhilaration from the last film is conspicuously lessened. 'Into Darkness' demonstrates everything wonderful about the Hollywood blockbuster: it's slick, shiny, snappy and often exhilarating. If 'Star Trek: Into Darkness' wasn't a reference quality presentation, there would have been something seriously wrong. Of course, the film looks and sounds spectacular. The 1080p 2.35:1 transfer is a genuine marvel, the spit and polish of the film's design presented with breathtaking clarity. The world of Star Trek is one of shining surfaces and curves, a vision of a gloriously modern future, and the team behind this film have executed that to perfection. A light filter of grain maintains a cinematic quality over the film, but doesn't obstruct sparkling fine detail or Abram's love affair with the lens flair. And then there's the Dolby TrueHD 7.1 track, which blasts gloriously from the speakers. This is a big film in every way, and the dynamism of the sound design, coupled with the terrific score, create an all-encompassing aural environment. There's nothing to fault with the audio-visual presentation Paramount have afforded this film. The film is also available on 3D Blu-ray. This is where things get tricky. At first glance, it seems like we've got an acceptable (if somewhat slight) set of features on offer. A series of featurettes cover the development of the film, changes in the design and the decisions around the character of John Harrison. All are handsomely produced, but in total, they only amount to around half an hour of content. And that's all. No commentary, no deleted scenes, no galleries. Where this gets complicated is that there is a commentary on the iTunes version (which wasn't available to check at the time of writing), and a number of U.S. exclusive editions offer various extra content that clocks into over an hour of extra material. In order to have all the excellent material created for the film, consumers in the U.S. have to buy four copies of the film, while in Australia, we don't have access to any of that material, apart from (hopefully) the commentary. For a major release, this might make sense for a market as big as the U.S., but for other countries unable to access that material, it's frustrating to say the least.